"It begins, as all wars doo, with a grievance." Like all good empires, the Greek empire had its power before falling. Same goes for the Persians. Where they intersect is Xerxes: The Fall of the House of Darius and the Rise of Alexander #1 from Dark Horse Comics. The issue is written and illustrated by Frank Miller and colored by Alex Sinclair. Persian King Xerxes sets out to conquer the world to avenge his father Darius's defeat and create an empire, unlike anything the world has ever seen . . . Until the hardy Greeks produce a god king of their own, Alexander the Great. Miller's legacy as a creator was more or less cemented by the time 300 came around, yet Xerxes: The Fall of the House of Darius and the Rise of Alexander #1 is the first work to tap into that world for a while. The book with the ridiculously long and drawn-out title feels equally as long and drawn-out at times as Miller follows a group of Athenians and Ionians this time (instead of Spartans). This is very familiar territory for Miller and the first issue doesn't really do anything to respond to the book's title other than possibly set up the outcome for down the line. Much of the issue is conveyed to the reader through the use of omnipresent narrator who guides the reader from battle to battle and informs them of the resulting happenings. While the Spartans in 300 had something of an underdog vibe going for them, Miller infuses the soldiers in this book with a pervasive sense of success which--in a way--makes the book feel boring at times because the new Greek factions seem to have no trouble running through the Persian army. The artwork is also handled by Miller and there's something about the minimalist style that's appealing and works well for the tale. Miller's scratchy, gritty style does well in capturing the atrocities of the battlefield, especially when it comes to the nonchalant way bodies are cleaved in half. Some of the renderings feel a little too simplistic though; almost as if Miller ran out of time. Miller does illustrated the book entirely in a landscape format which helps immensely with conveying the sense of scale of the armies to the reader. Sinclair's colors are dark and moody as well with just about every page tinged with red to represent spilled blood on the battlefield. 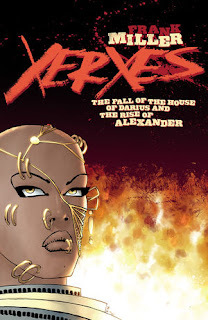 Xerxes: The Fall of the House of Darius and the Rise of Alexander #1 has some pretty big shoes to fill and not just because Xerxes was viewed as larger than life by his subjects and enemies. The Athenians and Ionians seem to be every bit as fierce fighters as the Spartans, determined to push on in the name of Greece. Miller's script feels a little anti-climatic at times, largely because the plot feels like a retread of 300. Miller's artwork is easily recognizable and gives the reader a glimpse into the grittiness of war, even if there are pages where the artwork is so simple it feels incomplete. Xerxes: The Fall of the House of Darius and the Rise of Alexander #1 doesn't really do much to address the title character other than by reputation and it's hopeful that the series gets to his downfall sooner than later. Xerxes: The Fall of the House of Darius and the Rise of Alexander #1 is available now.